Patients provide feedback in 3 easy steps! Upon checkout, patients immediately (and automatically) receive a text or email requesting feedback about their visits. 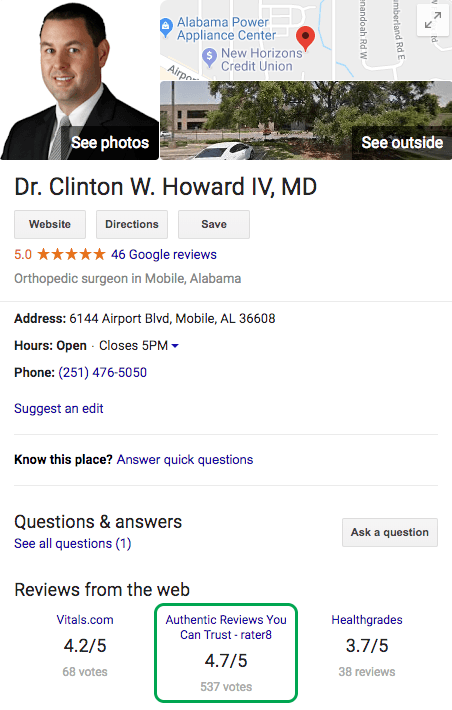 The questions, scored on a scale of 1 to 5 stars, focus on doctors, front desk staff, the check-in process, office, and more. At rater8, we respect your privacy. Patients can choose to remain anonymous or identify themselves. All patients also have the ability to opt-out of future communications. In Review Builder mode, patients are automatically redirected to each doctor’s preferred online review site. The patients are thanked for their feedback and are encouraged to share their thoughts with others online. rater8 supports all review sites including Google, Healthgrades, Yelp, Facebook, and Vitals. Was the patient unhappy with their treatment or experience? If so, an email alert is sent to the office administrator, alerting them of patient concerns. This way, the office can follow up appropriately and proactively address any concerns before patients post a review online – turning unhappy patients into practice evangelists. Drive more traffic to your practice’s website with rater8’s Verified Review pages. Here’s an example. 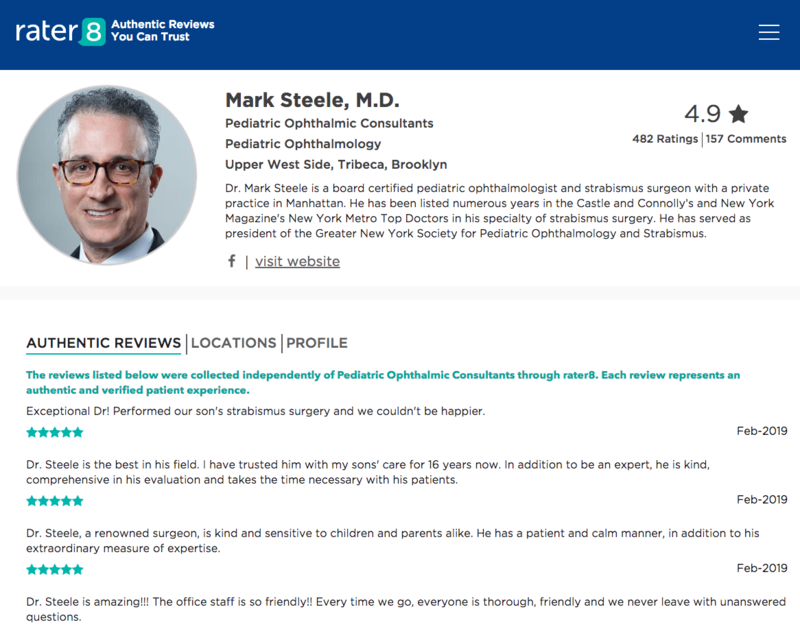 Share authentic, unfiltered reviews with new patients and enhance your online presence and search visibility. The Verified Review Pages feature 100% genuine reviews from verified patients. 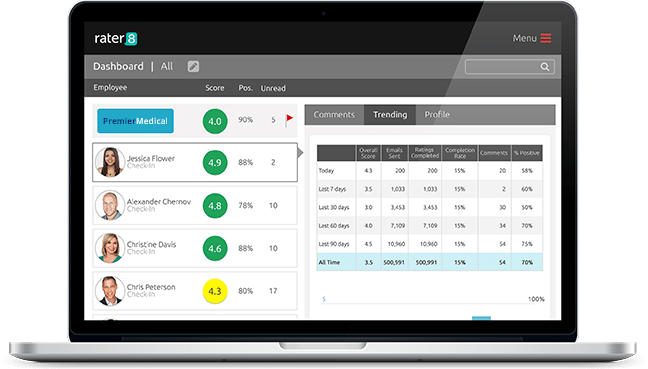 Learn why rater8 is the most trusted physician review platform among patients and online visitors. Proudly display your patient reviews on your own practice’s website using our rater8 Review Badges. These Review Badges are Google-friendly and SEO-optimized. See how these ratings are often featured in Google’s organic search results and Knowledge Graph. Gain real-time insights into how you and your team are doing. Have data-driven conversations, identify areas of improvement, track progress, and reward your top performers. 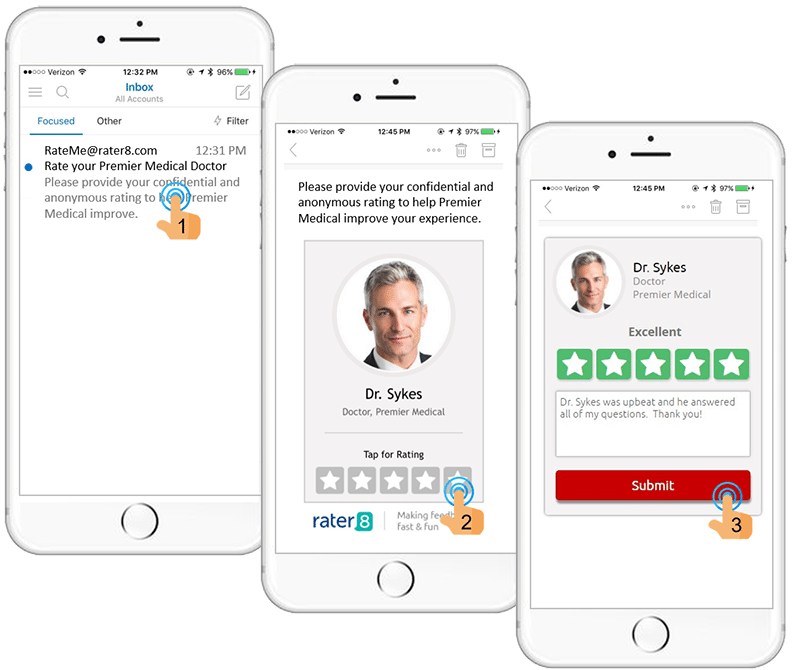 By focusing on building your online reputation with rater8, you amass a large number of online ratings quickly, drive more traffic to your practice’s website, increase the number of patient appointments, and enhance practice profitability. What are the different rater8 configuration modes? There are two modes available in rater8: Survey Mode and Review Builder mode. 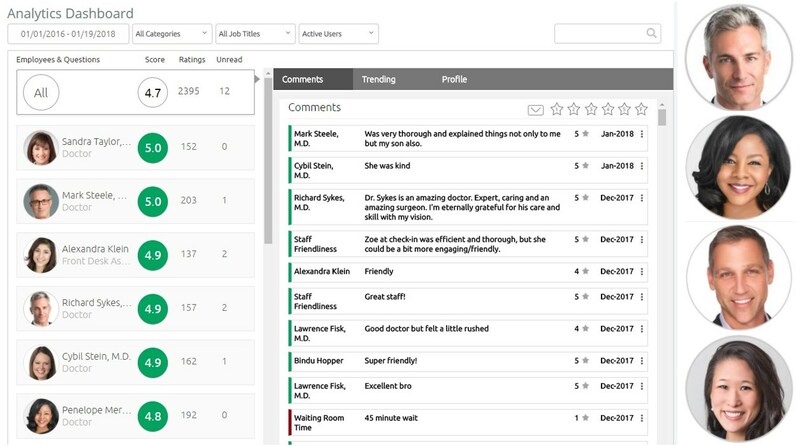 Survey mode collects all feedback within rater8 whereas Review Builder mode redirects patients to popular review sites such as Google, Healthgrades, Vitals, and Yelp. You can use either mode separately or a combination of both by choosing what percentage of emails are sent in each mode. Can patients opt out of communications? Yes – a patient can unsubscribe from email or text messages at any time. Is the patient data secure? rater8 takes privacy and data security seriously. When your practice management system sends us an HL7 file containing the patient’s appointment information, we process it and only store in our database the patient’s name, email address, and – at your option – mobile number. Other than these demographic fields, we neither receive from your practice managment system, nor store in our database, patient-related medical information like diagnoses, prescriptions, past procedures, etc. Once we process the HL7 files, we encrypt and archive them on our server. In addition, rater8 does not share or sell any patient names, email addresses, or phone numbers with any third party. How does the rater8 setup work? rater8 takes care of the setup and configuration. We have a team of implementation consultants that will get your medical practice running on rater8 within days. We strive to make the process pain-free and seamless for our customers. Which review sites can rater8 target? rater8 can target Google, Yelp, Healthgrades, Vitals, Facebook, and more. The preferred review platform can be set at the practice and doctor-level. rater8 can also build online reviews in parallel. 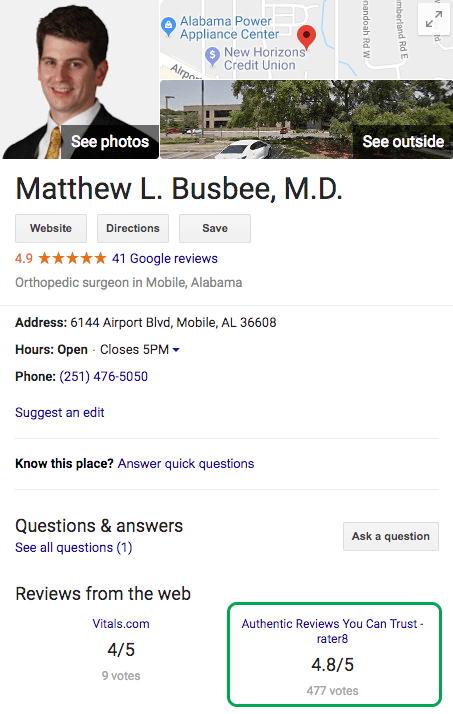 For example, administrators can choose to send 50% to Google My Business, 30% to Healthgrades, and 20% to Vitals. These percentages are easily configurable. When do the messages get sent to the patient? With a real-time interface with your practice management system, the moment the patient leaves your office, we send our RateMe email to the patient so that when they get to their car in the parking lot, they would already have the email on their mobile devices. The delay between checkout and receiving an email can be set in the software. Administrators can also configure the time between messages. For example, if a patient visits the doctor twice in one week, practices may not want to send the patient two satisfaction surveys. This is configurable within the software. Which practice management systems does rater8 support? We integrate with the leading practice management systems. Check out our integrations page to see some examples. If your practice management system isn’t on the list, we’ll add it! Speak to our solutions consultant to get started.